the hallway in our house came with an adorable, built-in hutch. 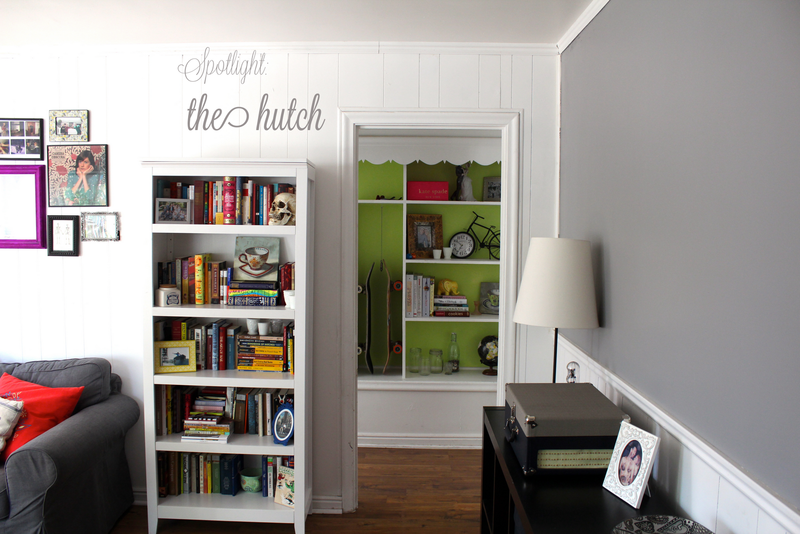 when we moved in, the hutch was a blank canvas: completely white... like the rest of the house. & since i couldn't come up with what to put in the hutch quite yet, i decided we had to paint it in the meantime. giving me more time to figure out what would go in it & because it's the first thing you really see when you walk through the door. it is straight behind the entrance & the white was incredibly boring. plus, you lost whatever cute details there were (like the top trim). i think austin was a bit hesitant on the whole idea of painting only the back wall of the hutch, & then probably even more hesitant when i presented him with the color of choice. but after painting the first section, he decided we had made a great choice & i have to agree. the shelves on the right are now the home to some of our china, my favorite picture from our wedding, our invitation photo & bicycle clock, cook books, a teacup painting & our collection of glass knick-knacks/jars & a globe. they filled it out perfectly & aren't too overwhelming which i was kind of worried about. the left hand side was a little more difficult to fill... but austin got it covered.he supplied the space with his skateboards, my one hunter boot he had in his car & his fishing poles. it's not the traditional decor for a hutch, but i must admit i kind of really like them there. 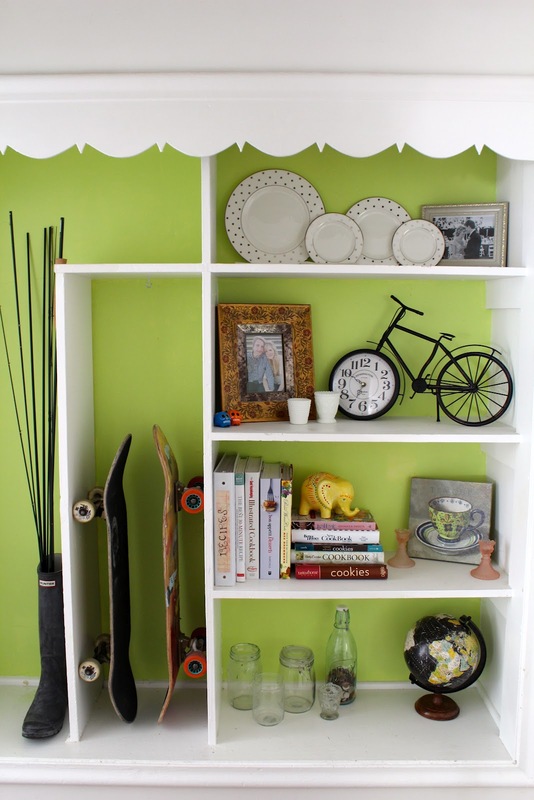 plus, it keeps the skateboards out of the way! the space where they are is just kind of a weird shape/size... i mean, i don't have anything tall enough to fill it... so i like that they fill the space & don't look cluttered.